Quick links to account functions plus a summary listing of data such as the number of claims by client or broker (this example is from an insurance broker extranet). Data is hyperlinked to detailed reports. Applications include HR, retirees, healthcare and medical information sites. Custom conceived and designed graphics and charts clearly explain more complicated benefits scenarios to visitors. 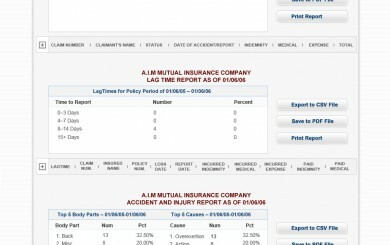 In this example, from an insurance deployment, an individual policyholder's summary is displayed - with data and charts to visualize that data. Our extranets are created with clients' unique data presentation needs in mind - this "loss run" report is a unique need for workers compensation insurance brokers and companies. Polar Design has developed secure portals and extranets for Insurance, E-Commerce, Multi-Employer and Taft-Hartley clients utilizing a range of technologies since 2005. As a result, we have developed experience and tools with third party system integration such as benefits administration, accounting, inventory, ERP and other software solutions. More than that, however, we bring a holistic approach to portal and extranet projects by getting to know our clients’ unique communication needs for the constituencies they hope to serve and designing highly functional, expressive and informative interfaces such as dashboards, animated infographics and charts. Far from being bells and whistles, these features assist our clients communicate key information faster and more accurately to extranet users, leading to greater cost savings and a higher level of participation.